Cell Biology is the discipline that studies the function of cells in the complexity of tissues and organs in the human body in order to understand mechanisms of disease. The tremendous revolutions in the past decade in light microscopy and biosensors to visualize processes in cells have changed cell biology completely. Cell Biology and Advanced Microscopy (CBAM) is a track within the 2-years Biomedical Sciences Master study and a collaborative effort by the University of Amsterdam (UvA) the Academic Medical Centre (AMC) and the Netherlands Cancer Institute (NKI), who collaborate in the van Leeuwenhoek Center for Advanced Microscopy (LCAM). These departments are all front runners in studying cell functions microscopically in time, even down to the single-molecule level. 4. advanced microscopy including live cell imaging, correlative light and electron microscopy, confocal microscopy and the underlying biophysics. or couple your favorite protein of interest to a fluorescent label. 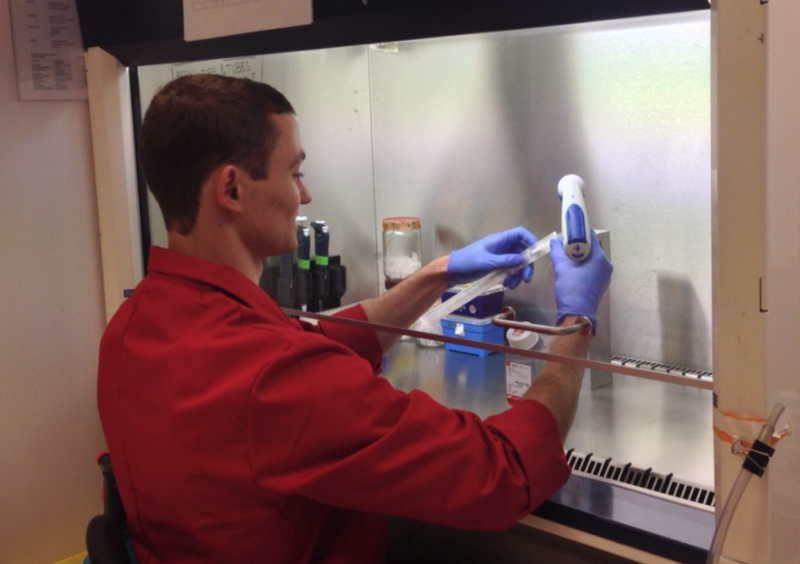 CBAM student Dave Huiskens created new constructs for better fluorescent proteins. The programme consists of three core courses and the participation in two or three internship research projects (9 or 6 months). The research projects lead to the writing of a thesis manuscript in English that is in principle suitable for publication in a scientific journal. Furthermore, two optional specialized courses in human disease such as cytopathology, medical microbiology, hematological diseases, fertility & sterility will be offered. after which the cells will start producing the fluorescently labeled proteins themselves. ▪ The first course is Molecular Biology of the Cell. This basic theoretical course of 4 weeks that is the same for all master tracks in the Medical Biology cluster will recap the molecular basis of cell function including proteins, membranes, DNA structure, cell metabolism, protein synthesis and cellular signaling. ▪ The second course is Advanced Microscopy. 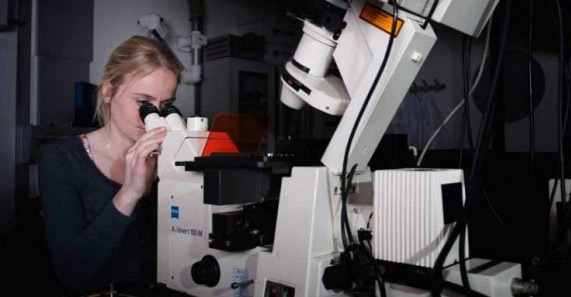 The aim of this 4-weeks practical course is to get hands-on experience and theoretical background in performing state-of-the-art (light) microscopy applied to cell biology. The microscope setups on which the training is provided, are part of the van Leeuwenhoek Centre for Advanced Microscopy (LCAM) in Amsterdam. During the first three weeks every day you will start with a lecture discussing a different fluorescence microscopy technique followed by a tutorial session. In the afternoon you will sit at the dedicated microscope and do the experiments yourself. In the final week you will select and perform a mini-research project in one of the three LCAM laboratories where you can apply and strenghten the acquired knowledge of the previous weeks. during the mini-research project week of the Advanced Microscopy course 2011. ▪ The third course is Clinical Cell Biology. This theoretical course of 4 weeks starts with a general lecture course treating cellular signaling, the cytoskeleton, mechanism/regulation of cell division, structure of cells in tissues, apoptosis, fertility, cellular basis of cancer and metastasis, infection by viruses. The majority of the course consists of actual clinical cell biology topics of research groups at the UvA, AMC and NKI. Topics will include: Structure/function of invapodia, mechanisms of cancer cell migration, role of TRPM7 channels & signaling (NKI); Neurodegenerative diseases, viral/bacterial infection & cytopathology, DNA-damage/repair mechanisms in relation to cancer (AMC); GPCR-signalling, cell division machinery, Ca2+ signaling, signalosome formation at membranes, biosensors and pharmacology (UvA). out of your images like concentration, transport speed or the degree of interaction with other proteins. Here the mobility of nuclear protein SNAIL is monitored at various sub-cellular locations via Matlab scripts (image from Marten Postma & Ada Dattoli). Advanced microscopy applied to clinical cell biology problems will form the backbone for the research projects. 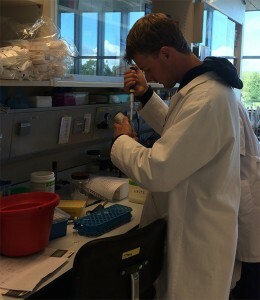 The LCAM partners at UvA, AMC and NKI provide the research projects in close collaboration with scientists in which the master students can participate. A typical example of such a research project is to create your own genetic encoded sensor (using GFP labeling and cloning techniques), cell transfection & manipulation, performing experiments with living cells using advanced microscopes, interpreting image data, image analysis and processing and finally the design of follow up experiments. It is strongly advised to do at least one research project at one of the three participating departments in LCAM and one research project abroad in one of the many international research labs that collaborate with LCAM. Is Cell Biology & Advanced Microscopy the programme for me? For more info about this Master study click here for the UvA website or contact the track coordinators Dorus Gadella (FNWI) or Eric Reits (AMC). The UvA organizes on regular basis “meeloopdagen” where you can join a current CBAM student for a day, to get an impression how the Masterstudy Cell Biology & Advanced Microscopy will look like.